On June 14th, 2016, The Alabama Department of Transportation (ALDOT) hosted a Public Involvement Meeting for the proposed project to help improve safety on the eastbound side of the George Wallace Tunnel. 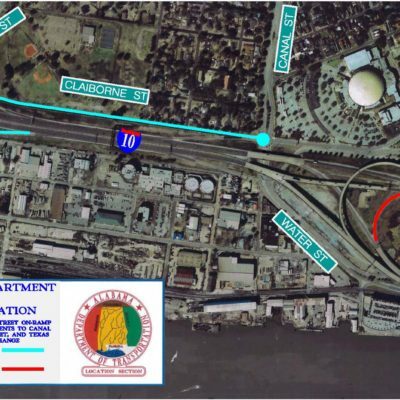 The project consists of “closure of I-10 Eastbound Water Street On-Ramp and improvements to Canal Street, Claiborne Street and Texas Street Interchange.” The project, intended to be a temporary solution to safety issues on I-10, will reroute eastbound traffic to avoid the merge on-ramp just before entering the tunnel. Though the alternative route may add commute time from Downtown Mobile to the Eastern Shore, the project intends to greatly reduce the number of traffic accidents in that area. If the project is approved, ALDOT has indicated that implementation and construction will begin in the fall of 2016 and be completed by spring 2017. Please visit www.buildthei10bridge.com for up-to-date information on I-10 Bridge project news and future meetings, as well as follow the Build I-10 Bridge Coalition on Facebook and Twitter. We encourage you to review the proposed I-10 eastbound water street on-ramp closure project and provide comment. Please visit http://rp.dot.state.al.us/WSC-TSI/ for more information. All comment forms are due no later than 5:00 PM on Tuesday, June 28th, 2016.